A cheese plate can make or break any at-home happy hour. Whether you’re entertaining family or friends, everyone loves a well-rounded cheese plate with unique flavors and perfect accompaniments. But creating the perfect cheese plate is harder than it may seem. Mix the wrong stinky cheese with a fruity wine and havoc will reign. In order to learn How to Make a Cheese Plate, follow the instructions below. Breads: Make sure to include different types of breads such as a sliced baguette, bread sticks, and crackers. Condiments: The condiments can vary from vegetables, preservatives (honey is delicious), or tangy mustards. Meats and Nuts: A good mixture of salty meats (such as salami), pistachios, and dried fruits can really add flavor to your cheese plate. Fresh and Mild Cheeses: These cheeses are not aged and very fresh. Examples include Ricotta and Buffalo Milk Mozzarella. Bloomy Rind Cheeses: These molding cheeses are often creamy. The most famous cheese in this category is Brie. Mild Semi-Soft to Semi-Firm Cheeses: These basic cheeses serve as a good foundation for a cracker and fruit combination. Examples include Colby and Monterey Jack. Boldly Flavored Hard Cheeses: This sharp cheese category includes Gouda and Cheddar. Cheese with Dominant Presence: These powerful cheeses can be extremely delicious with the right accompaniment (such as dark chocolate). One of the best examples from this category is Muenster. I would love this I though, I’ve never tried it looks so tempting and yummy. I love your graphic too. That is a great infographic. 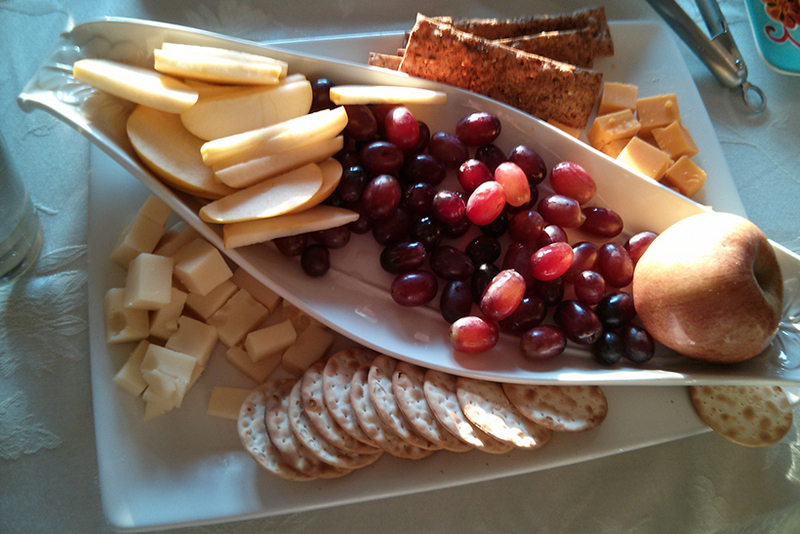 I love cheese plates because it is something I can eat as a low carber. Muenster cheese will always be my favorite–and then sharp cheddar and then–oh heck I love cheese!! These really are good suggestions for making up the perfect cheese platter-now my problem would be–I just might eat all the cheese before the guests arrived!!! I didnt know there was a method to making a cheese plate. Gotta try some of these suggestions for more yummy combos. We host a lot of parties and a cheese plate is a staple. I will try these tips next time. Your cheese plate is gorgeous! I love cheese and pairing it with grapes and dry fruits with some wine is one of my favorites when we have company! After all, variety is the spice of life! I love to mix/match different cheeses. Especially soft with hard. Nom nom. Now I’m hungry! I love adding dried fruit to mine. I love these combinations, and I’m totally craving cheese right now. I think a variety of cheese types is great too! Excuse me while I run to the store. I need to recreate this stat! I’m planning a dinner party and I love these tips.